So, on my front burners are picture and chapter books that I can't live without, a recap of the best of 2013 for kids (picture and chapter books) including the best of the best, adult books of 2013 that you must buy for gifts (or for yourself), and graphic novels for kids ... and that's probably the best I can do without staying up all hours. If you're thinking, why in the world is she doing this -- well, it's purely selfish ... I love to talk books and I really love to write about them and I'm not good at shutting up. Ask my husband. "Bark, George," says George's mother, and George goes: "Meow," which definitely isn't right, because George is a dog. And so is his mother, who repeats, "Bark, George." And George goes, "Quack, quack." Can two fish, tails going swish, help? What about three moose, munching on spruce? Bright, spirited illustrations by Jane Chapman enhance this one-of-a-kind counting tale by Phyllis Root - a feast of sounds and numbers that will have listeners scrambling to join in the slippy, sloppy fun. Max has plans to stay up late to see Santa Claus, but his big sister, Ruby, wont let him. “Why?” asks Max. To which Ruby replies everyone’s most despised answer: “BECAUSE!” So Max takes matters into his own hands and sneaks into the living room to wait for Santa on his own. Will Santa still show up? What will he say if he sees Max up waiting for him? It's a rainy, rainy day, and Baby Duck hates rain. Mrs. Duck says she's never heard of a duck not liking rain. 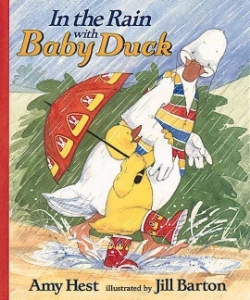 But then Grampa Duck and Baby Duck come down from the attic with a little umbrella and rubber boots that belonged to . . . whom? . . . Mrs. Duck! Baby Duck grabs them up with glee and goes outside to play. This ducky story—wonderfully illustrated with watercolors full of tender expression—will have every puddle jumper wishing for rain. A perfect tale for cat lovers—and for younger siblings. Ginger the cat lives a comfortable, well-tended life. But when a pesky kitten moves in, Ginger's days of ease are over. Now it seems he must share his bed and his meals with the intruder forever! What is a pampered cat to do? The award-winning Charlotte Voake knows all about cats and their peculiar ways, as every reader of this dear and funny tale will soon find out. Once upon a time there was an old man and an old woman who were very lonely. They decided to get a cat, but when the old man went out searching, he found not one cat, but millions and billions and trillions of cats! Unable to decide which one would be the best pet, he brought them all home. How the old couple came to have just one cat to call their own is a classic tale that has been loved for generations. H.A. and Margret Rey introduced the world to Curious George, and the world has loved him ever since. The tales of this cheerful and resilent little heror have kept generations of readers enthralled and entertained. This lavish 70th Anniversary edition includes an introduction by Leonard S. Marcus, Publisher's Perspective by Anita Silvey, retrospective essay by Dee Jones with photographic album of Margaret and H. A. Rey, and the seven original tales of Curious George: Curious George, Curious George Gets a Medal, Curious George Flies a Kite, Curious George Rides a Bike, Curious George Goes to the Hospital, Curious George Takes a Job, and Curious George Learns the Alphabet. Once there was a caterpillar named Farfallina, whose best friend was a gosling named Marcel. They did everything together -- until one day, everything started to change. This beautiful and touching story shows that even as life takes different turns, friendship endures. There are lots of dogs of all shapes and sizes at the animal shelter. But Kate and her mom and dad know they want Dave the moment they see him. He’s small and cute and a perfect fit for the end of Kate’s bed. But then they see Rosy, who is old and gray and broad as a table. How can they take home just one dog when there are so many wonderful animals who need a home? Bob Graham creates an original, endearing family in a touching story that will appeal to animal lovers everywhere. A new rendition of a beloved classic. "Concisely written text and a jazzy refrain....You may have other versions on your shelves - make lots of room for copies of this one." - The Bulletin of the Center for Children's Books, starred review. How all this comes about is Mr. White's story. Ralph the mouse ventures out from behind the piney knothole in the wall of his hotel-room home, scrambles up the telephone wire to the end table, and climbs aboard the toy motorcycle left there by a young guest. His thrill ride does not last long. The ringing telephone startles Ralph, and he and the motorcycle take a terrible fall - right to the bottom of a metal wastebasket. Luckily, Keith, the owner of the motorcycle, returns to find his toy. Keith rescues Ralph and teaches him how to ride the bike. Thus begins a great friendship and many awesome adventures. It’s 1936, in Flint, Michigan, and when 10-year-old Bud decides to hit the road to find his father, nothing can stop him. Winner of the 2000 Newbery Medal, and the 2000 Coretta Scott King Award. When ten-year-old India Opal Buloni moves to Naomi, Florida, with her preacher father, she doesn't know what to expect. She is lonely at first--that is until she meets Winn-Dixie, a stray dog who helps her make some unusual friends. Because of Winn-Dixie, Opal begins to let go of some of her sadness and finds she has a whole lot to be thankful for. Thirteen-year-old Sophie hears the sea calling, promising adventure and a chance for discovery as she sets sail for England with her three uncles and two cousins. Sophie's cousin Cody isn't sure he has the strength to prove himself to the crew and to his father. Through Sophie's and Cody's travel logs, we hear stories of the past and the daily challenges of surviving at sea as The Wanderer sails toward its destination—and its passengers search for their places in the world. What happens when Joey and his sister, Mary Alice — two city slickers from Chicago — make their annual summer visits to Grandma Dowdel's seemingly sleepy Illinois town? August 1929: They see their first corpse, and he isn't resting easy. August 1930: The Cowgill boys terrorize the town, and Grandma fights back. August 1931: Joey and Mary Alice help Grandma trespass, poach, catch the sheriff in his underwear, and feed the hungry — all in one day. And there's more, as Joey and Mary Alice make seven summer trips to Grandma's — each one funnier than the year before — in self-contained chapters that readers can enjoy as short stories or take together for a rollicking good novel. In the tradition of American humorists from Mark Twain to Flannery O'Connor, popular author Richard Peck has created a memorable world filled with characters who, like Grandma herself, are larger than life and twice as entertaining. All Harry Potter knows is a miserable life with the Dursleys, his horrible aunt and uncle, and their abominable son, Dudley — a great big swollen spoiled bully. Harry’s room is a tiny closet at the foot of the stairs, and he hasn’t had a birthday party in eleven years. Stay tuned for more gift suggestions as I recap the best of adult books for 2013 next. Follow A Book Long Enough's board Build A Core Collection of Children's Books at Home on Pinterest.